The devastating cyclone Hudhud may have taken several lives and brought massive devastation to coastal areas of south Odisha and parts of coastal Andhra Pradesh but it has proved to be a boon for fishers and people a few hundred kilometres away in lower Assam. After the cyclone hit several Indian states on October 12, the availability of the much sought after hilsa or ilish fish increased to a great extent on the river Brahmaputra in the lower Assam districts of Dhubri and Goalpara. This has helped fishers earn much more than they do in a normal season. This happened last year as well when the devastating cyclone Phailin hit Odisha coast. According to fishery experts, it is as a result of the impacts of the Hudhud cyclone that the Brahmaputra river and several of its channels have got swamped with this much sought after variety of fish. During the normal season, a kilogram of hilsa is sold at Rs 350 to 500 in the wholesale market in Dhubri and Goalpara, and at Rs 600 to 750 in the retail market, which sometimes goes up to Rs 800 as well. However, this phenomenon has suddenly increased the availability of hilsa fish, and as a result prices fell in the market and decreased to Rs 100 to Rs 200 per kg. 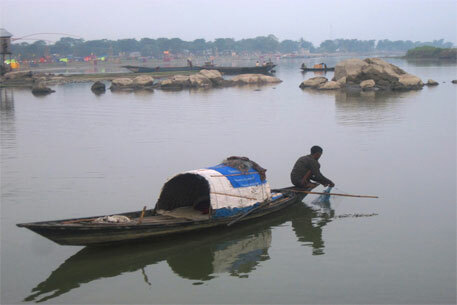 “The Hilsa fish usually keeps away from rough environment in water bodies, so when the cyclone occurred groups of these fish migrated to safer areas, including the Brahmaputra river,” says Haren Das, district fishery officer of the Dhubri district. Das adds that since there was disturbance in the water in the Bay of Bengal because of the cyclone, these fish swam to find safer places, and this way entered the Brahmaputra river. The fishery officer, however, says this is short-lived phenomenon. “This sudden surge in the availability of hilsa fish will come down soon and after that it will be like it was before,” he says. Soymudeep Datta, director of the local environment group Natures Beacon, says that hilsa can survive and breed both in saline and non-saline water, and this is one reason why it has not been affected after entering the river Brahmaputra from the Bay of Bengal. Das says that it is almost like a repetition of the last year’s Phailin when the availability of the fish shot up. A fisher person says that normally his catch of hilsa is less than a quintal a day, but after the cyclone the catch has gone up almost 12 to 15 times, and this has benefitted them financially to a great extent. “Also, in the normal days we have great difficulty in caching these fish, but now they are easy to catch as they are not staying deep in the river. There have been days when we have caught up to 20 quintals of the fish in a single day, and that too without much difficulty,” says Nur Islam, a 45 year old fisher from the Dhubri town in Assam. Islam says that on a normal day he is not able to earn more than Rs 1,000 and the average amount earned is usually around Rs 500, but since the cyclone has hit the country, his earning has not been below Rs 3,000 per day, and on a few occasions it has also crossed Rs 4,000. Islam adds that he had no savings, but in the past two weeks or so, he has been able to save almost Rs 40,000 to 45,000 which he has deposited in his bank account. Hemchandra Das, a 50 year old fisher person from Dhubri has earned enough to repair the damages of his thatched hut where he and his four-member family live. “I usually earn less than Rs 1,000 a say, so it is never possible for us to save and we end up spending our entire earning at the end of the month, but the last two weeks or so has been like winning a lottery for me, and I have been able to earn over Rs 3,000 every day,” says Das. “Fishing has become so easy the past weeks or so as the hilsa can be found swimming on the surface of the river,” adds Das. The fish sellers who sell fish on a retail basis have, however, not been so lucky. As a result of the abundance of hilsa fish in the market, large quantities of fish are left unsold in the market and rots very soon after that. “During the normal time, the supply of hilsa in the market is very limited and the demand is high, and usually the fish doesn’t remain unsold in the market. There are times when we are given orders by our customers over the phone and we are requested to keep aside hilsa for them,” says Chandan Das, a fish retailer in the Dhubri town. Das adds they don’t have cold storage system or big refrigerators for the fish and so their profits are not much. In the absence of storage, retailers had to lower the price as a result of the competition, and prices dipped below Rs 150 per kg, an unheard of price for the prized fish. Pulok Das, a fish retailer in Goalpara town, reports a similar trend. “Usually only some of the fisherman who go out to fish are able to catch a good number of this fish and this is given out to fish whole-sellers and retailers in the market, and the fish which lands in the market for sale is much sought after, and so its demand and prices are high,” says Das. The districts fishery officer says the fish is readily available with almost every fish seller in each and every market in Dhubri and Goalpara districts were selling this much sought after variety of fish, which created steep competition and lowered the price. “Initially we were thinking that we will be able to reap very good profit from this situation, but it didn’t turn out to be so, and it was simply business as usual for us, the fish retail sellers,” says Das. 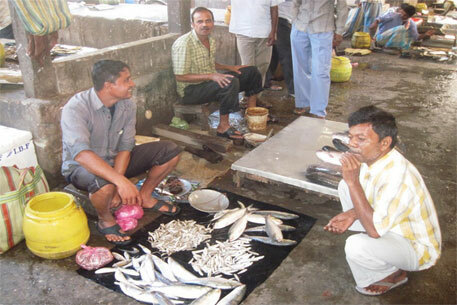 The fish wholesale traders in these two districts, however, have been among the luckier ones. When they saw the price fall, they immediately started focusing on sending the hilsa fish to nearby states and towns where the fish is in demand. They are sending the fish to Siliguri and Cooch Behar in West Bengal, and also to fish traders in Bihar. “After we saw the price falling, and noticed that a huge quantity of the hilsa fish was remaining unsold in the market, we started focusing on sending more fish to the towns in the nearby states,” said Biswajit Roy, a wholesale trader based at the Dhubri town. “There is no cold storage facilities for storing fish here in the Dhubri and Goalpara districts, but there are such facilities in the towns to where we are sending the fish, and the fish traders are happy to buy the fish from us as they are able to store it for some days if necessary before being able to sell those,” says Roy. Roy adds that normally they send out prawn and some local variety of fish to the towns in the nearby states. “We are now sending on an average 50 to 70 quintals of hilsa daily and the whole sale price ranges between Rs 250 to Rs 400. It was very essential to sell these out of the state, as daily we receive truckloads of fish, including hilsa fish from other states as well,” says Roy. On being asked if their profits would have been more had there been cold storage facilities for fish in the district, Roy says that if such facilities were present then their profit would have gone up several times.